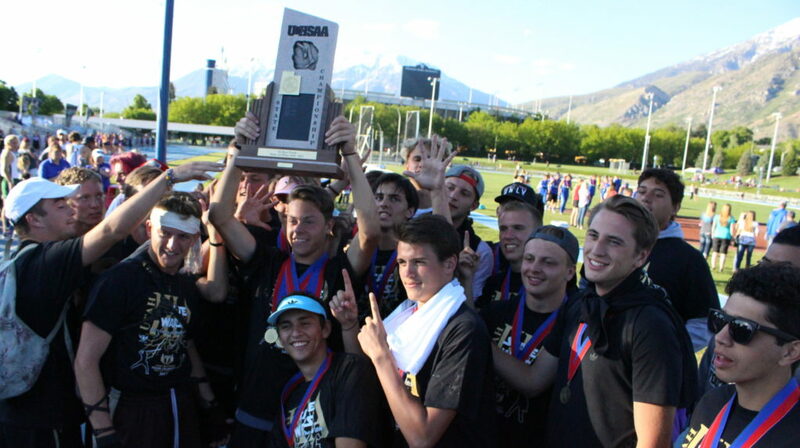 PROVO – The Desert Hills Thunder boys team jogged a victory lap and held up five fingers as they carried a championship trophy high above their heads. It didn’t seem like they could smile any bigger. And why not? 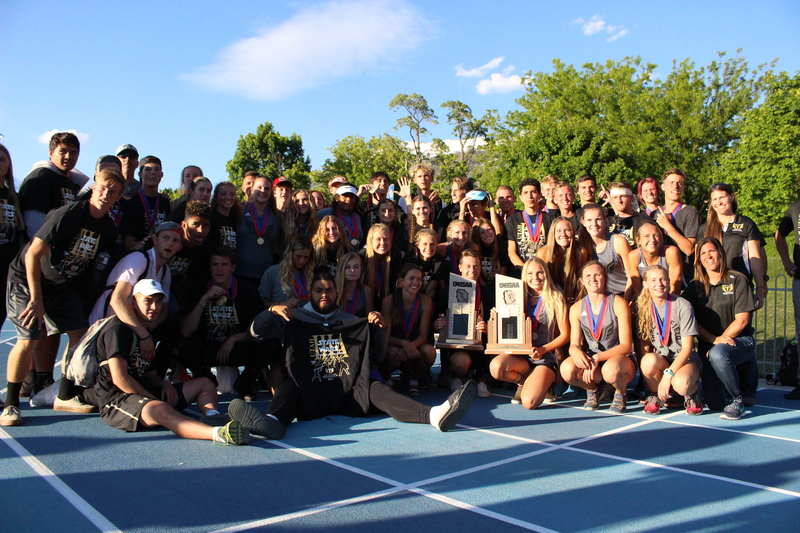 Desert Hills tied a state record Saturday at the Utah State Track & Field Championships. 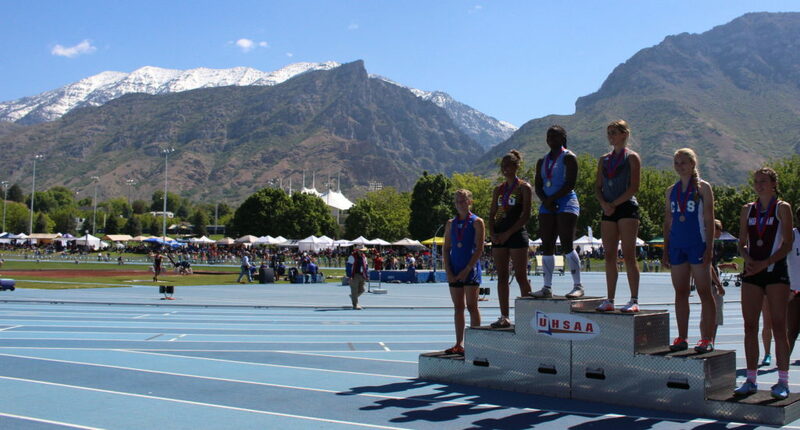 Only twice in Utah history has a school won five consecutive state track titles. 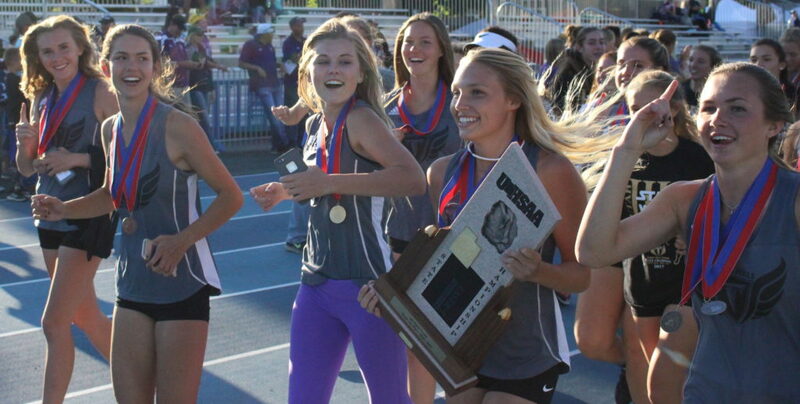 To add to the festivities, the Desert Hills girls team joined them on their victory lap with their own state title trophy in hand. It’s plain to see, coaches and players have figured out some magic formula at DH. The Thunder boys scored 130 points as a team, ahead of second-place Hurricane (76). Thunder girls nabbed a school record in team points at 164, edging out Cedar (130) in a two-horse race for the girls title. Third place Dixie scored 49 points. D-Hills coach Dace Goulding said that maybe that magic formula responsible for Desert Hills’ success comes as a result of their mastering the concept of team. Goulding added that coaches from around the school have helped build Desert Hills into a powerhouse. While in years past distance runners often carried Desert Hills, this year sprinters propelled the Thunder to a title. DH proved itself the quickest in the state, winning the 4×100 relay (Riley Swaney, Bradley Earl, Cooper Kenney and Zachary Mardsen). Earl also won the 100 meters (10.91), the 200 meters (21.91), and the 400 (48.06). 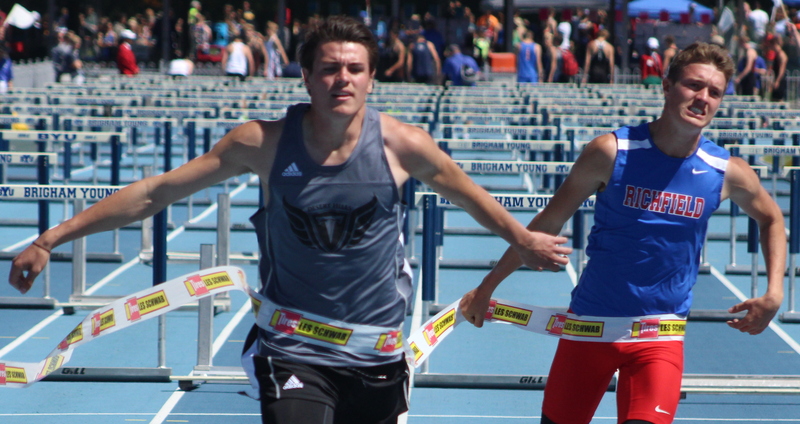 Carter Reynolds won the 110-hurdles (14.75) and the 300-hurdles as well (38.75). On the girls side, Kaylee Carter, who has already signed to run for UVU, capped her senior year with her third consecutive 300-meter hurdles championship (44.20). Carter also finished in second (15.13) in the 100-hurdles just behind region rival Starlee Woodbury. The Desert Hills girls also won all three relays. Laynee Wells placed second in the 800 at 2:18, and Elly Williams won the shot put with a throw of 40-feet, 4-inches and also placed second in the discus. 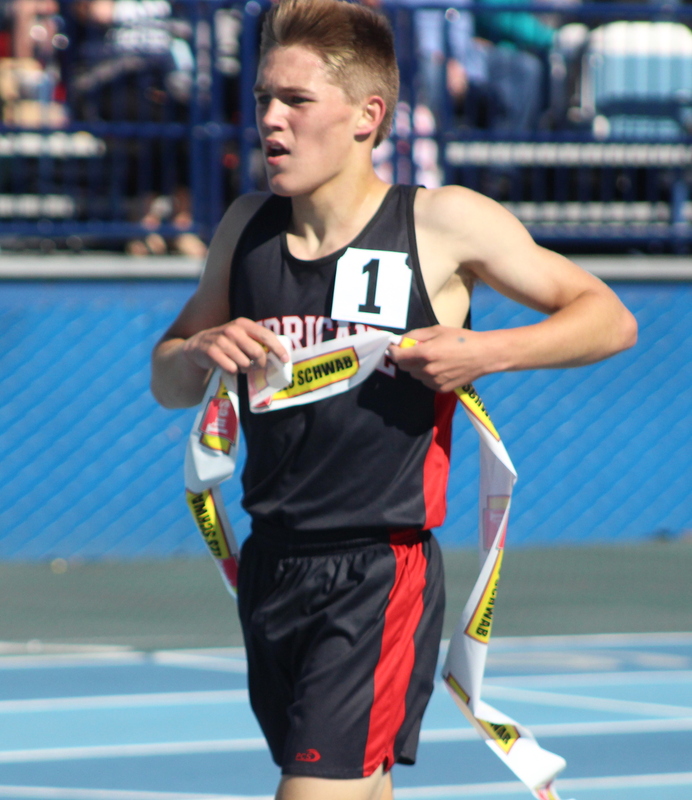 Hurricane sophomore Kaleb Armstrong surprised many by upsetting defending state champ Jaiden Melendrez (DH) and region champ Jensen Lambert (Cedar) as he won both the 1600 (4:18) and the 3200 (9:21). Armstrong trailed Lambert in the 3200 Saturday on the final lap, but made a kick to pull ahead with just 80 meters left. Dixie’s Starlee Woodbury, who has signed to run for Weber State next year, won the 100-hurdles (14.90) as expected, but also won the 100-meters (12.47). In the girls 1600, Region 9 runners filled the top nine places, including winner Mic Webster of Cedar and runner-up Bailey Brinkerhoff of Desert Hills. 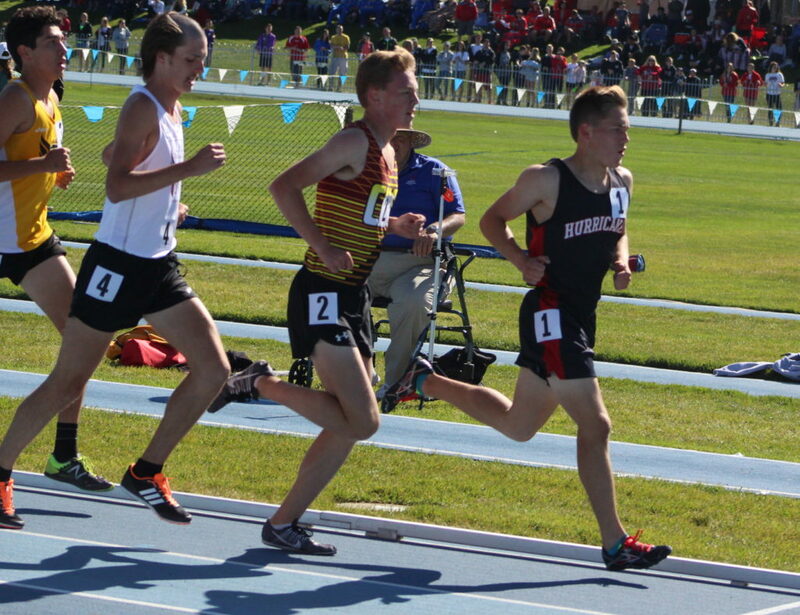 Webster also won the 3200 with Brinkerhoff coming in second and Region 9 placing the top seven. Kate Sorensen of tiny Gunnison High School won the 100-hurdles in 2A, and would have taken gold in any classification. 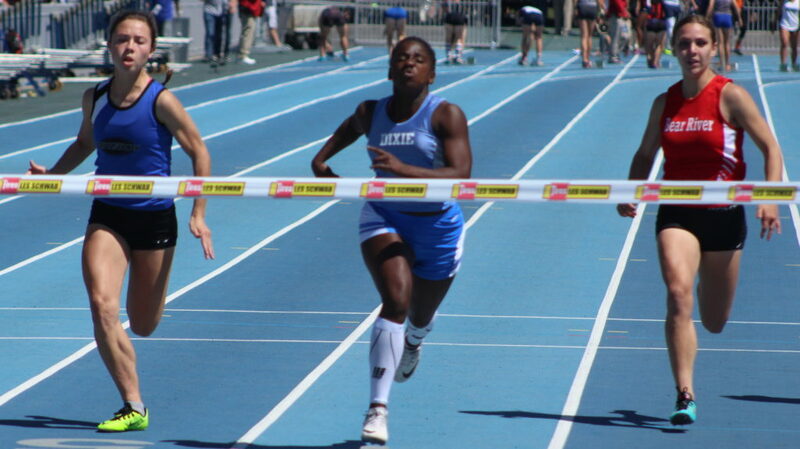 She ran a 14.52, .27 faster than the next fastest girl, 5A West’s Brianna White. Reynolds’ 14.75 in the 110-hurdles would have won him gold in all classifications except 5A, where he would have finished second to Syracuse’s Tanner Kiutterer (14.69). Enterprise junior Jaslyn Gardner has been setting records all year and she took the 100 gold with a time of 11.89, which was faster than any girl, 1A through 5A. 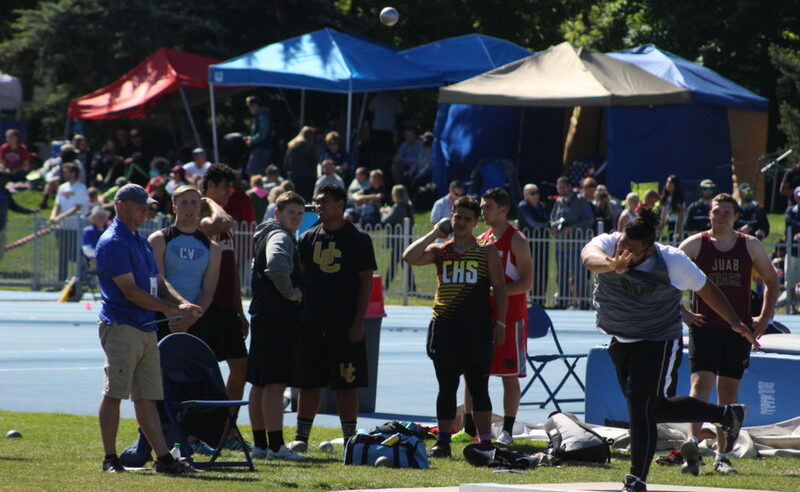 The D-Hills 4X100 ran the 400 meters in 42.67, faster than any team in the state in any class. Kaysie Klemic won the 800 for Cedar’s girls with a time of 2:17.74. Hurricane’s Armstrong brothers, senior Caden and sophomore Caleb, photo-finished in the 800. Big bro Caden won by .09. For full results and all the individual medalists, go to runnercard.com.